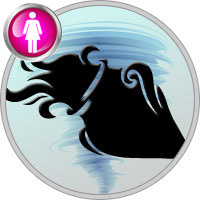 If you are in love with a woman in this zodiac be prepared to be very happy or be very sorry. She is a very busy person with her own matters similar to a guy in this zodiac. She is able to live by herself without any guy in her life, a very strong person indeed. Not because she does not have a dream guy, but if she can not find such person, so what. Because she thinks she could do anything that a man can do. She is a leader, a real confident type. She likes a COOL guy who sometime act like he is ignoring her, so he has a chance to show him his own confident. She like to guess her man’s reaction, but at the same time she likes to has many men wanting her. She is a daring type who could just do thing differently from other people in her same society. She dare to fight for what she thinks belonged to her. Even she acts confident she mostly feel lonely and alone. If she breaks up with someone, she won’t show any emotion even deep down inside pain and agony. Not for long she will come back to be the cheery and merry person again, because she looks at the world positively and has "Faith" in the word "Love". She has more men friends than women friends, so do not be a jealous type if you date her. She could be slightly jealous, but she hates jealous guy. She loves "Freedom" so before and after marriage, her freedom has to be the same. She likes you to trust her, even if she does not trust you anyhow. She likes to be the one who is "Right", so if you argue with her, let her win if it is not a big deal for you in that subject. She is a straight forward type, so if she does not love you anymore, she will just tell you straight to your face. Her love and relationship are always real, so if she say "It’s over" be prepare to leave, she is not testing you. She is not a vulnerable type, so do not have to worry about her, she will survive by herself. If she is with you when you get sick, she will certainly take care and look after you, even look after you mean "small loan". Do not have secret with her, she hates it and really can piss her badly. When she is sad, be understanding. When she is happy, be happy with her, she likes that. You will not get bore with this type of girl. Someone who is close to her will know that deep down beneath that confident and cold hearted person, she is just as fragile as any woman. She is a fun and talkative person and she likes to tease you. Do not let she talk alone, if you do she will leave. She has many type of jobs because she beliefs what a man can do, I can do. If you want her to work for you, forget it. When she is in love, she will just leave her job in the day time just to come to see you, but not for long she will go back to work seriously again. Prepare to live and love with a "Working Woman" then you will be OK.